Shortly after Bush took office, a government scientist prepared testimony for a Congressional committee on the dangerous effects of industrial uses of coal and other fossil fuels in contributing to “global warming,” a depletion of the earth’s protective ozone layer. The White House changed the testimony, over the scientist’s objections, to minimize the danger (Boston Globe, October 29, 1990). Again, business worries about regulation seemed to override the safety of the public. 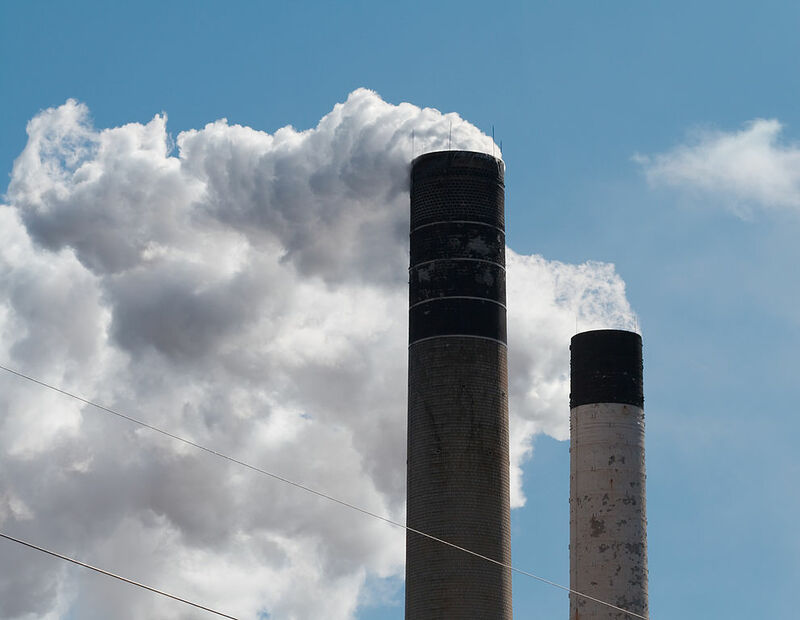 At international conferences to deal with the perils of global warming, the European Community and Japan proposed specific levels and timetables for carbon dioxide emissions, in which the United States was the leading culprit. But, as the New York Times reported in the summer of 1991, “the Bush Administration fears that … it would hurt the nation’s economy in the short term for no demonstrable long-term climatic benefit.” Scientific opinion was quite clear on the long-term benefit, but this was not as important as “the economy”—that is, the needs of corporations. Evidence became stronger by the late eighties that renewable energy sources (water, wind, sunlight) could produce more usable energy than nuclear plants, which were dangerous and expensive, and produced radioactive wastes that could not be safely disposed of. Yet the Reagan and Bush administrations made deep cuts (under Reagan, a 90 percent cut) in research into renewable energy possibilities. As if to prove that the gigantic military establishment was still necessary, the Bush administration, in its four-year term, launched two wars: a “small” one against Panama and a massive one against Iraq. Coming into office in 1989, George Bush was embarrassed by the new defiant posture of Panama’s dictator, General Manuel Noriega. Noriega’s regime was corrupt, brutal, authoritarian, but President Reagan and Vice-President Bush had overlooked this because Noriega was useful to the United States. He cooperated with the CIA in many ways, such as offering Panama as a base for contra operations against the Sandinista government of Nicaragua and meeting with Colonel Oliver North to discuss sabotage targets in Nicaragua. When he was director of the CIA in 1976-1977, Bush had protected Noriega. But by 1987 Noriega’s usefulness was over, his activities in the drug trade were in the open, and he became a convenient target for an administration which wanted to prove that the United States, apparently unable to destroy the Castro regime or the Sandinistas or the revolutionary movement in El Salvador, was still a power in the Caribbean. Claiming that it wanted to bring Noriega to trial as a drug trafficker (he had been indicted in Florida on that charge) and also that it needed to protect U.S. citizens (a military man and his wife had been threatened by Panamanian soldiers), the United States invaded Panama in December 1989, with 26,000 troops. Liberal Democrats (John Kerry and Ted Kennedy of Massachusetts, and many others) declared their support of the military action. The Democrats were being true to their historic role as supporters of military intervention, anxious to show that foreign policy was bipartisan. They seemed determined to show they were as tough (or as ruthless) as the Republicans. But the Panama operation was on too small a scale to accomplish what both the Reagan and Bush administrations badly wanted: to overcome the American public’s abhorrence, since Vietnam, of foreign military interventions. Two years later, the Gulf War against Iraq presented such an opportunity. Iraq, under the brutal dictatorship of Saddam Hussein, had taken over its small but oil-rich neighbor, Kuwait, in August 1990. 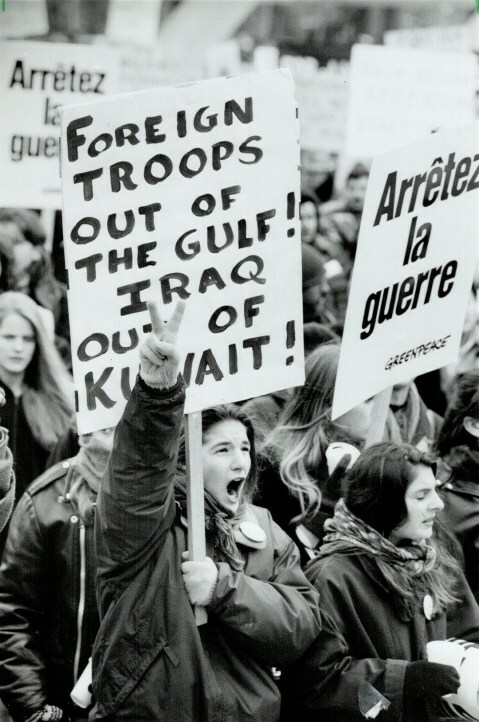 Protesters voice their opposition to the Persian Gulf War at Nathan Phillips Square in Toronto. Image: Colin McConnell/Toronto Public Library. On October 30, a secret decision was made for war against Iraq. The United Nations had responded to the invasion of Kuwait by establishing sanctions against Iraq. Witness after witness testified before Congressional committees in the fall of 1990 that the sanctions were having an effect and should continue. Secret CIA testimony to the Senate affirmed that Iraq’s imports and exports had been reduced by more than 90 percent because of the sanctions. But those motives were not presented to the American public. It was told that the United States wanted to liberate Kuwait from Iraqi control. The major media dwelled on this as a reason for war, without noting that other countries had been invaded without the United States showing such concern (East Timor by Indonesia, Iran by Iraq, Lebanon by Israel, Mozambique by South Africa; to say nothing of countries invaded by the United States itself—Grenada, Panama). The justification for war that seemed most compelling was that Iraq was on its way to building a nuclear bomb, but the evidence for this was very weak. Before the crisis over Kuwait, Western intelligence sources had estimated it would take Iraq three to ten years to build a nuclear weapon. Even if Iraq could build a bomb in a year or two, which was the most pessimistic estimate, it had no delivery system to send it anywhere. Besides, Israel already had nuclear weapons. And the United States had perhaps 30,000 of them. The Bush administration was trying hard to develop a paranoia in the nation about an Iraqi bomb which did not yet exist. Despite months of exhortation from Washington about the dangers of Saddam Hussein, surveys showed that less than half of the public favored military action. In January 1991, Bush, apparently feeling the need for support, asked Congress to give him the authority to make war. This was not a declaration of war, as called for by the Constitution; but since Korea and Vietnam, that provision of the Constitution seemed dead, and even the “strict constructionists” on the Supreme Court who prided themselves on taking the words of the Constitution literally and seriously would not intervene. Read more about the Bush administration in Chapter 21, “Carter-Reagan-Bush: The Bipartisan Consensus,” of A People’s History of the United States. ← Howard Zinn Remembers Whitney Young Jr.